When Lord Strickland published his first newspaper in 1921, at the time he set up his political party, he did not even have a printing press yet. 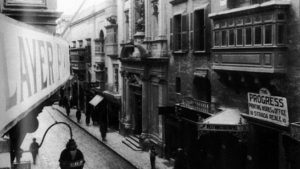 In a matter of months, he set up his first printing workshop in Valletta’s main street, then called Strada Reale, opening the way for the building of the island’s largest newspaper company and the publication of two national newspapers, The Times and The Sunday Times, today regarded as national institutions. Progress Press in the 1920s in Republic Street, Valletta. He called his first political newspaper Il Progress, a name he adopted for his printing works, Progress Press. The flagship title, Times of Malta, was born in the following year as the name of a supplement to Il Progress, but in 1929 the supplement was turned into a weekly. In the intervening period, Strickland published other newspapers in Maltese but the most important daily was Il-Berqa. By far the most important milestone in the history of Strickland House newspapers was the publication of the daily English language Times of Malta in 1935. By now Progress Press had already moved to St Paul Street, right across the side entrance to the Auberge de Castille, today the prime minister’s office. Strickland had no doubt as to the precise mission the new daily had to have, and it was clear that in launching the daily, he and his daughter Mabel had in mind breaking new ground, both in the modern concept of newspaper publishing as such and, even more so, in journalism proper. Apart from being the “friend of the public”, the newspaper had to be of service to the community. That spirit has remained as the major motivating force of Strickland House newspapers and of the company that runs them. The Times of Malta was well received from the start. Giving a strong helping hand at the time was Lord Strickland’s second wife, Margaret Hulton, whose father had the largest newspaper empire outside Fleet Street. Her brother owned the Evening Standard in Britain and his son had Picture Post. Lord Strickland put the publishing side of his organisation on stronger foundations when he set up Allied Malta Newspapers Limited on June 15, 1939. 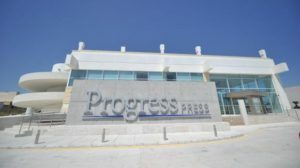 Progress Press premises in Mrieħel. The company flourished but on October 15, 1979 it received a setback when political arsonists attacked the press and razed the building to the ground. But it was quickly rebuilt, with both the company and its newspapers establishing even stronger foundations. Today, Allied Newspapers Limited has developed into a news and information platform, breaking into the new information age with a website and other information services that support the group’s publishing wing. Progress Press has also kept up with the times, moving to a new state-of-the-art printing house at Mriehel. There are two other companies in the group, MediaMaker, which specialises in the publication of high-quality magazines, and Allied Retail and Commercial Co. Limited.